What a treathot homemade pizza, with exactly the toppings you like. And this crust adapts to YOUR schedule: make the dough now, and serve fresh pizza up to 2 days later. Please read this recipe all the way through before starting. It gives you a lot of baking options, and you want to choose the one that best fits your schedule. 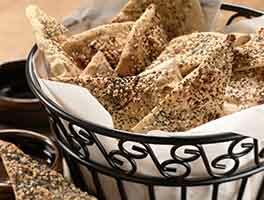 Our guarantee: This flavorful pizza crust recipe is crisp when rolled ultra-thin, and chewy when made thick. Combine the dissolved yeast (or the instant yeast) with the remainder of the ingredients. Mix and knead everything togetherby hand, mixer or bread machine set on the dough cycletill you've made a soft, smooth dough. If you're kneading in a stand mixer, it should take 4 to 5 minutes at second speed, and the dough should barely clean the sides of the bowl, perhaps sticking a bit at the bottom. Don't over-knead the dough; it should hold together, but can still look fairly rough on the surface. To make pizza up to 24 hours later, skip to step 5. To make pizza now: Place the dough in a lightly greased bowl, cover the bowl, and allow it to rise till it's very puffy. This will take about an hour using instant yeast, or 90 minutes using active dry. If it takes longer, that's OK; just give it some extra time. To make pizza later: Allow the dough to rise, covered, for 45 minutes at room temperature. Refrigerate the dough for 4 hours (or for up to 24 hours); it will rise slowly as it chills. 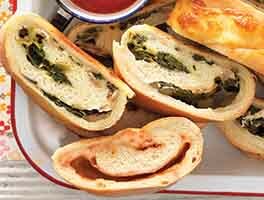 This step allows you more schedule flexibility; it also develops the crust's flavor. About 2 to 3 hours before you want to serve pizza, remove the dough from the refrigerator. Divide the dough in half, for two pizzas; or leave it whole for one pizza. If you're making a rectangular pizza, shape the dough into a rough oval. For a round pizza, shape it into a rough circle. In either case, don't pat it flat; just stretch it briefly into shape. Allow the dough to rest, covered with an overturned bowl or lightly greased plastic wrap, for 15 minutes. Use vegetable oil pan spray to lightly grease the pan(s) of your choice. Drizzle olive oil into the bottom of the pan(s). The pan spray keeps the pizza from sticking; the olive oil gives the crust great flavor and crunch. Place the dough in the prepared pan(s). Press it over the bottom of the pan, stretching it towards the edges. You'll probably get about two-thirds of the way there before the dough starts shrinking back; walk away for 15 minutes. Cover the dough while you're away, so it doesn't dry out. Allow the dough to rise, covered, till it's noticeably puffy, about 90 minutes (if it hasn't been refrigerated); or 2 to 2 1/2 hours (if it's been refrigerated). Towards the end of the rising time, preheat the oven to 450°F. Bake the pizza on the lower oven rack till it looks and feels set on top, and is just beginning to brown around the edge of the crust, but is still pale on top. 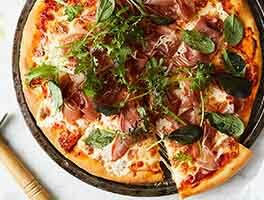 This will take about 8 minutes for thinner crust pizza; about 10 to 12 minutes for medium thickness; and 12 to 14 minutes for thick-crust pizza. If you're baking two pizzas, reverse them in the oven (top to bottom, bottom to top) midway through the baking period. To serve pizza immediately: Remove it from the oven, and arrange your toppings of choice on top. Return to the oven, and bake on the upper oven rack for an additional 10 to 15 minutes, until the crust is nicely browned, both top and bottom, and the cheese is melted. Check it midway through, and move it to the bottom rack if the top is browning too much, or the bottom not enough. To serve pizza up to 2 days later: Remove the untopped, partially baked crust from the oven, cool completely on a rack, wrap in plastic, and store at room temperature. When ready to serve, top and bake in a preheated 450°F oven, adding a couple of minutes to the baking times noted above. Your goal is a pizza whose crust is browned, and whose toppings are hot/melted. Make pizza any shape or size or thickness you like; the above guidelines are simply suggestions. Understand that the thickest-crust pizza will need to bake longer than the thinnest-crust version. To freeze partially baked pizza crust: Bake crust as directed in step 13. Remove from the oven, cool to room temperature, wrap well, and freeze for up to 3 months. When you're ready to serve pizza, remove the crust from the freezer, and allow it to thaw, loosely wrapped, at room temperature. Once it's completely thawed, complete pizza by starting at step 15 above. What else can you to with this tasty crust? How about fresh, hot cheese stuffed bread sticks? 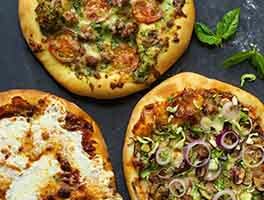 Our step by step blog will show you what pitfalls to avoid on your way to these pizza shop favorites. 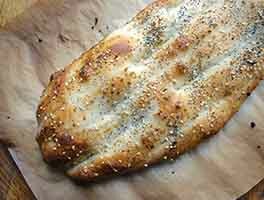 This is a great recipe and easy to make, tasted great Is it possible to let the dough to sit more then 24hrs? A couple of qusestions. 1. Can I use this dough for tossing on a hot stone in a pizza oven that gets to be about 750°-800°? I know really short cooking time but just looking for thoughts. 2. Can this be frozen after proofing and knocking down for future use? Thanks! This was my first attempt of making my own pizza crust and it was successful. The instructions were easy to follow and as a result I had one large square pizza crust of medium thickness. The crust provided enough space for different toppings in different areas. Everyone loved it and we even had a few slices left for breakfast. 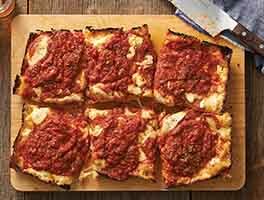 Tried this recipe and the pizza was great. Willbeceryainly sabingthis recipe for future use. It's delicous as written. It's rich and crisp on the outside and more tender on the inside. I use olive oil on a parchment topped pan. When I want a crisper thinner crust, and when I have time to preheat my pizza stone, I've also made it without the pan. In other KA recipes, yields and pans are in the notes (I'm thinking of sourdough starter focaccia). This one appears to have more steps, but it all goes very quickly. The only difference is slightly longer initial rising time and no rest in the frig if you want to do a same day pizza. Sometimes I skip a second rise or modify it if i am in a rush. As per reviews below and my own experience, I weigh ingredients and sometimes use other KA flours (just taking care to add liquid to approximate the correct texture described). Your steps make NO sense. You gotta categorize if you're going to recommend 4 different times, lengths, and whatever else to allow the dough to rest. Your process gave me a headache. I make it nice and thin, and prebake on a stone for a little longer than the recipe calls for for a crispy crust. Man oh man, this makes a great pizza. It's a people pleaser. I've struggled with pizza dough for years, but this made the best pizza crust I've ever made. I ended up freezing half the dough for a couple of days, and when I thawed it out I could only let it rise in the pan for about an hour. This crust was even better than the first one! Now, that was at a friend's house with a round pan. I have a pizza stone. How should I modify the baking to account for the stone? Great recipe, but can you please change the tsp measurements to grams?